Iranian Red Crescent Medical Journal - Yellow Scorpion Bite: Ignore or Take it Seriously? Yellow Scorpion Bite: Ignore or Take it Seriously? To Cite: Azizi K, Akbarzadeh A, Ghobadifar M A. Yellow Scorpion Bite: Ignore or Take it Seriously?, Iran Red Crescent Med J. 2016 ; 18(12):e59045. doi: 10.5812/ircmj.28942. Scorpion stings are a major public health problem in many countries. The southern areas of Iran are characterized by a warm and dry climate. Many species of scorpion are found in Iran, some of which are dangerous (1, 2). Among the different species found in this area, yellow colored scorpions are more prevalent, with the two main species being Mesobuthus eupeus and Hemiscorpius lepturus (3). Both of these species are prevalent; they are both yellow and they are approximately the same size. Distinguishing between the two species is very important because it helps to determine the appropriate treatment and prognosis following a sting. A Mesobuthus eupeus bite is not dangerous and it does not usually cause any complications (3), while Hemiscorpius lepturus venom is dangerous and may cause acute renal failure and even death if it is not properly managed (4). Fortunately, the two species can be easily distinguished. A Mesobuthus eupeus bite causes severe pain, as well as a burning sensation and swelling at the bite site, while a Hemiscorpius lepturus bite causes little local pain, although it can produce deep and necrotic ulcers at the bite site. 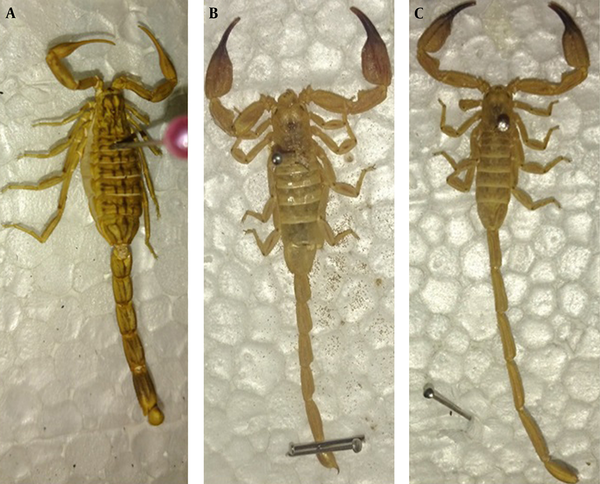 Envenomation by Hemiscorpius lepturus scorpions could easily be overlooked or underestimated because of the limited pain at the site of the bite (5). Furthermore, the two species are different in appearance, as shown in Figure 1. The dorsal part (tergum) of Mesobuthus eupeus features irregular black to dark brown stripes and small dark spots, while Hemiscorpius lepturus does not have dark spots on its tergum. Additionally, male Hemiscorpius lepturus scorpions have longer tails than female ones. A, Mesobuthus eupeus characterized by a wide body, tail, and stinger, oval shaped hands with yellow chela fingers, and dark spots on the tergum (dorsal part); B and C, male and female Hemiscorpius lepturus, respectively, characterized by a thin body, tail, and stinger, wide hands with dark colored chela fingers, and without dark spots on the tergum. The emergency injection of anti-venom and admission to hospital is crucial in cases of Hemiscorpius lepturus envenomation, since it can cause hemolysis and, consequently, acute renal failure in the first 24 hours (6). Although there are guidelines available for health care providers regarding the management of victims of envenomation, the abovementioned points could be helpful for achieving timely and appropriate interventions.